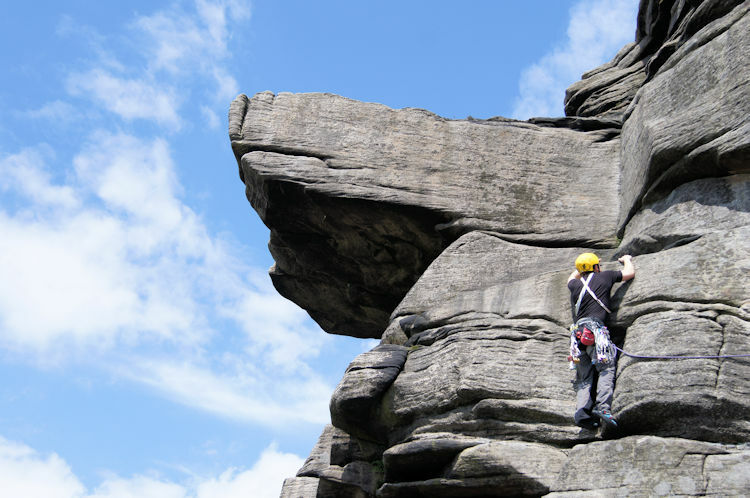 Summary: Stanage Edge is one of the most popular outdoor locations in England. Many flock here, most to learn the basics of rock climbing. 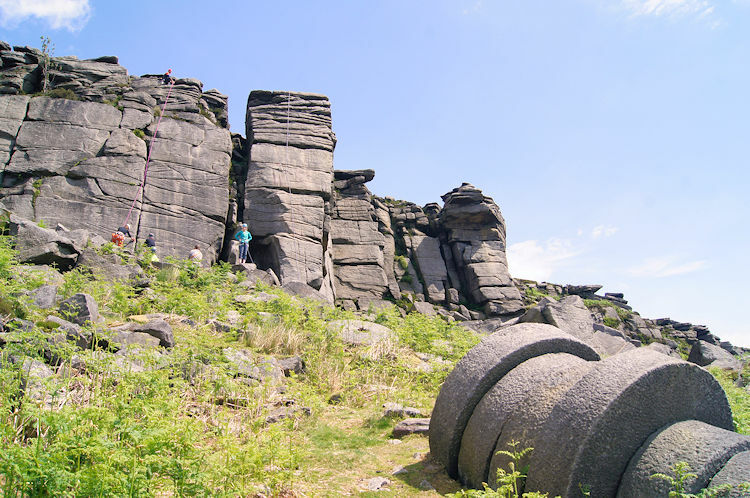 This walk takes us from Hathersage on country tracks to Stanage Edge and then along the top, past the adrenaline junkies, then returning to Hathersage along countryside lanes. Some of the views during the walk are utterly beautiful so do hope for a clear day. 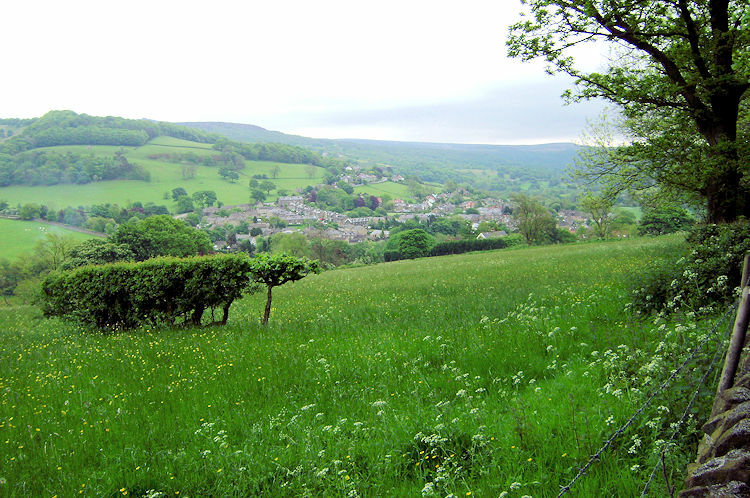 Hathersage, situated in the Hope Valley on the A6187 between south Manchester and south Sheffield is, like its neighbours Hope and Castleton, a very popular village. The A6187 is often busy, and occasionally gridlocked during weekends and the holiday season but this does not deter the droves of visitors determined to reach their destination. There are two reasons for this. 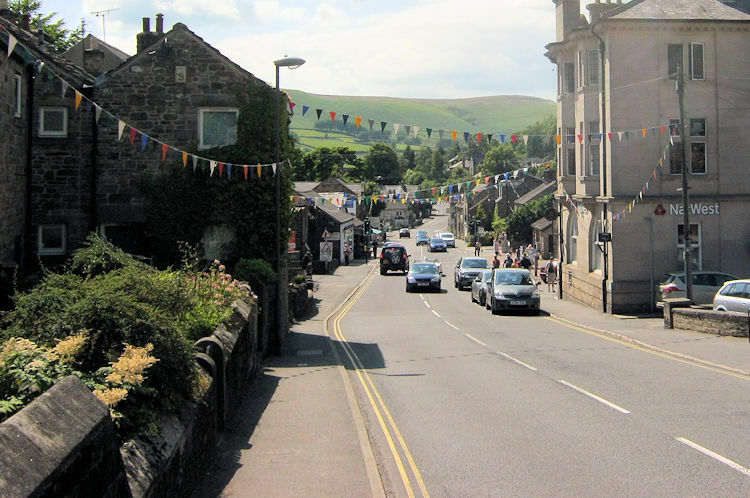 Firstly the villages along the Hope Valley are beautiful places and they have diversified to accommodate all kinds of visitors, those coming for a walk up and down the streets to sit in parks or go for lunch and also for those going further afield, venturing out into the great wide open. I am one of the latter. I also try to avoid the busy times, there is nothing worse than going for a re-energising walk after a traffic journey of jams, of queues, in essense a journey of turmoil. That is never a good way to start a walk, especially a walk of beauty and of adventure like this classic dark peak walk. So let's go, setting off from the village centre leaving the crowds behind. 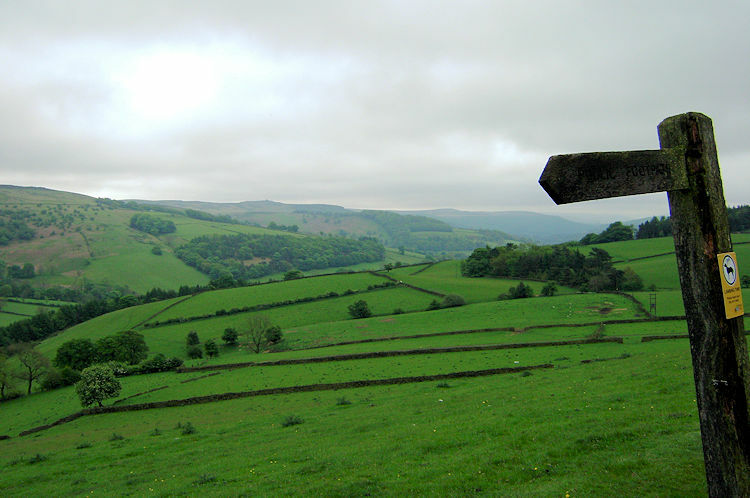 I walked from Hathersage centre due north along a track and was soon relieved of the noise of the village. The weather was overcast but at least it was dry. The day was forecast to brighten up but the spring day did not promise an immediate burst of sunshine. Perhaps it would brighten up when I reached Stanage Edge. To get there I walked along tracks, past farms and alongside pasture fields steadily climbing from the valley to height. After just over a mile and 200 metres of climbing I eventually emerged from the series of pasture fields and on to open fell side just after I had passed Toothill Farm. It would have been nice to stay on unmade tracks but the only one available led me to the tarmac road from Hathersage to Stanage Edge. At least the verge was wide and the traffic was light. I followed the roadside. Fortunately the upland views were unveiling now and I looked east to the impressive sight of Higger Tor and Hathersage Moor. Then my attention turned to the north. Stanage Edge was dead ahead. As I walked along the roadside there were more and more glints of sunshine appearing in the distance, particularly in the northwest on the Derwent Moors. Thoughts of sunshine breaking through were parked as I set about my immediate task, to climb from the car parking area at Hookcar Sitch onto Stanage Edge. From total solitude I was now amid other people, not lots, it was still early, but still enough to repeat the obligatory "hello" a number of times. There were quite a few groups of youngsters being taught the basic skills of rock climbing. Stanage Edge provides a perfect nursery, easily accessible, not too challenging for an adult but scary enough for anyone under five foot tall. 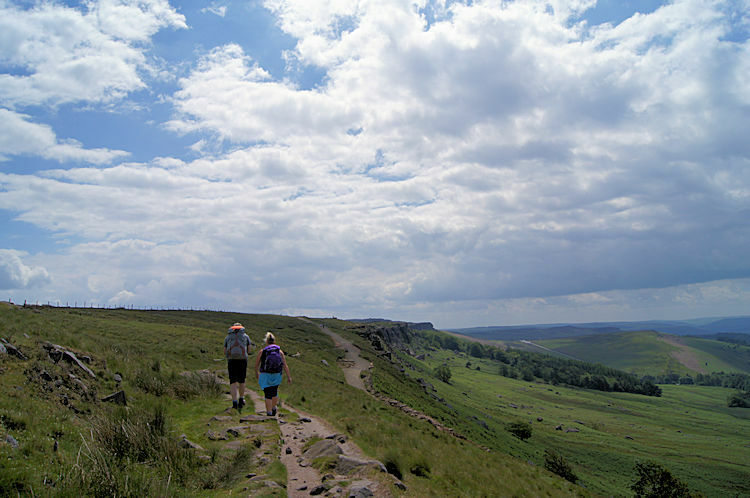 I walked sedately past the leaders and their charges and past the couples and few mature groups whose adventure to be on Stanage Edge was to enjoy the amble on the top, without rope and without fear. After gazing at the endeavours of the climbers for fifteeen minutes or so I walked along the top of Stanage Edge northwards. I traipsed on the edge for almost a mile, constantly looking east over the expanse of Hallam Moors and looking west down to the Hope Valley. All along the mile of high walking I passed people and although always polite I did wish I was alone. 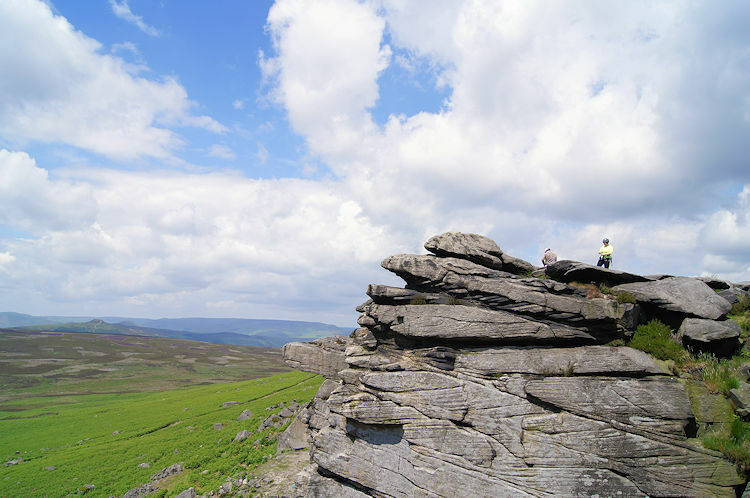 There is something about Stanage Edge, an aura that I sometimes feel on my walks. 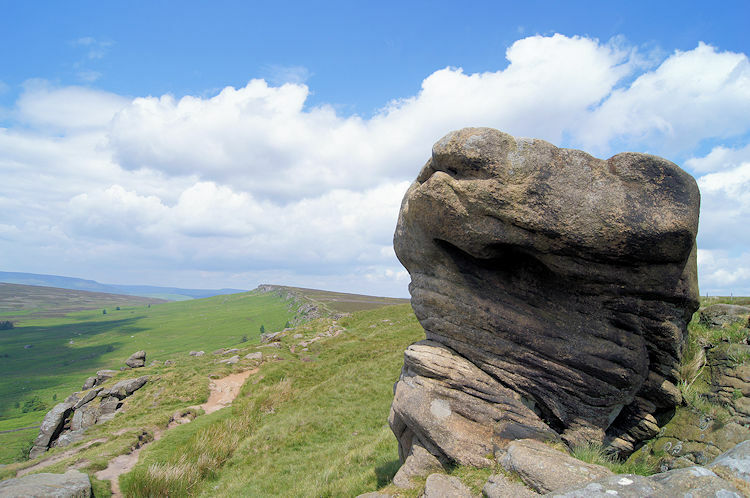 Perhaps it is because it is so well known, so revered as one of the places that must be visited in the Peak District. More so, I believe it is because of its character and the total contrast of environment nearby. The view east to White Path Moss and Hallam Moors is total wilderness, a nothingness, a complete bogland, flat and intimidating. 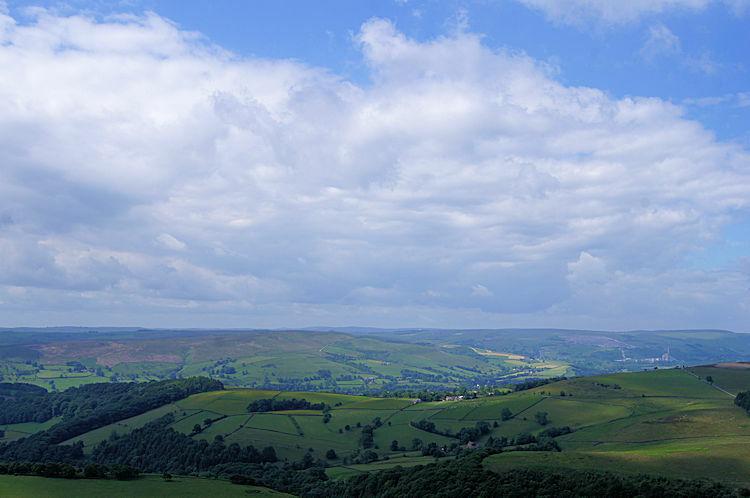 The view west to Hope Valley is beautiful, lush and green with exciting contours, lovely villages, idyllic rural England. 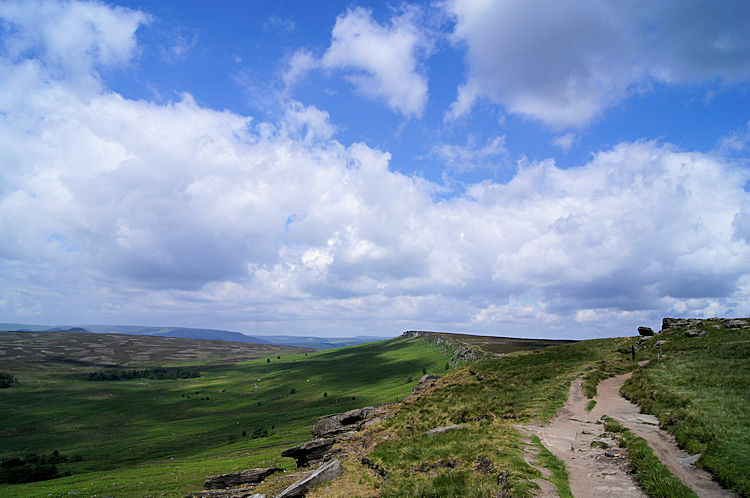 The difference between the view to the east and to the west is striking and Stanage Edge provides a definite boundary between the two. It really is a remarkable contrast. After descending from Stanage Edge I never saw another person until I arrived back in Hathersage. It is as if all others were magnetised to the place. I made my way down from the escarpment and headed on tracks west, through woodland and through pasture once more towards Green's House and then to Upper Hurst Farm before reaching Hurstclough Lane. The views of the surrounding countryside were splendid. Soon afterwards I arrived at Nether Hurst which provided a lovely view of the rooftops of Hathersage. A few more field crossings later I was back in Hathersage and done. I could have walked the circuit again, such enjoyment it was.